35 years' experience in "black gold"
There is a paradoxical consequence of the financial crisis: To produce bitumen is more attractive than ever. In the last six months prices for crude oil and, in particular, the consumption of heavy, sulfur-containing marine Diesel fuel (bunker oils) have dropped, while at the same time the need for bitumen has gone up all over the world due to government infrastructure investment programs. For this reason, the demand for Biturox® plants to produce road bitumen in an economical manner is increasing. Pörner Ingenieurgesellschaft mbH, Vienna offers a bitumen oxidation technology - the so-called Biturox® process - that chemically changes crude oil residues and other refinery feedstock so that finally good bitumen can be produced. Since its foundation in 1972 Pörner has built up more than 30 Biturox® plants around the world. Today approx. five percent of the world’s road bitumen production amounting to 100 million tonnes per year are produced by the Biturox® process, the remaining part is produced by direct distillation of heavy oils. A high quantity of bitumen can be yielded by chemical conversion of middle crude oils that are preferably used at refineries to produce fuels. That’s why fully automated Biturox® plants have successfully been implemented in advanced European refineries over the last years. The high benefit of this continuous process is based on the unique internal loop reactor with a multistage agitator and pressure maintaining. The efficient and yet gentle feed-in of atmospheric oxygen as well as exact temperature control allow for short blowing times and a precise control of the chemical reaction. The result: high flow rates with constant product quality. Since bitumen is very complex from the chemical point of view, broad practical experience is required to specifically apply oxidation by air. In particular, the selection of the right raw materials, their mixture and processing is based on the know-how in the bitumen chemistry to produce bitumen cost-efficiently. In order to minimize emissions in the reaction off-gas Pörner has developed efficient removal strategies for different fields of application. In a basic variant approx. 80 % of the hydrocarbons contained in the off-gas are condensed and directed back to the refinery. The residual gas is burnt in an incinerator at 850 °C. Sulfur emissions are removed in a caustic scrubber and thus reduced to a minimum. Flue gases from the thermal post-treatment are also treated by installing the scrubber downstream the incinerator and heat recovery unit. 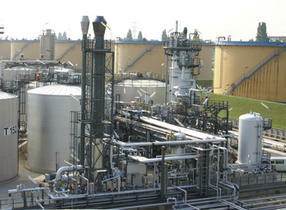 Biturox® plants are mostly erected at refineries or (less often) as stand-alone units. The plants have throughputs of 40,000 to 250,000 tpa (with one reactor) and up to 1,000,000 tpa (with 2 reactors) resp. They consist of reactor(s), air compressors, pumps, heat exchangers for feed preheating and product cooling, an exothermic reaction unit and the off-gas treatment system with exhaust air incineration. Bitumen being a complicated medium requires special experience in piping and selection of instrumentation and process control system. On 2nd of December 2008, Pak-Arab Refinery Ltd (PARCO) and Pörner Vienna held a ceremony to sign the contract for engineering and erecting of a Biturox® plant. PARCO is a joint venture of the Governments of Pakistan and Emirates of Abu Dhabi. The Biturox® plant would be located at PARCO’s Mid-Country Refinery near Multan in central Pakistan. In January 2011 the Biturox® plant is planned to go into production. Pörner will provide the design by the end of 2009. The overall scope of work by Pörner includes licensing, basic and detailed engineering and construction supervision. With a production capacity of 165,000 tpa, the plant will play a major role in various highway and infrastructure programs of Pakistan. Compared with other refinery production plants a Biturox® plant is a small investment, however often a very economic one. It enables producers to use especially efficient raw materials mixtures from a refinery to produce more and better bitumen at lower cost. The oxidation plant can be operated in a modern refinery without any problems.